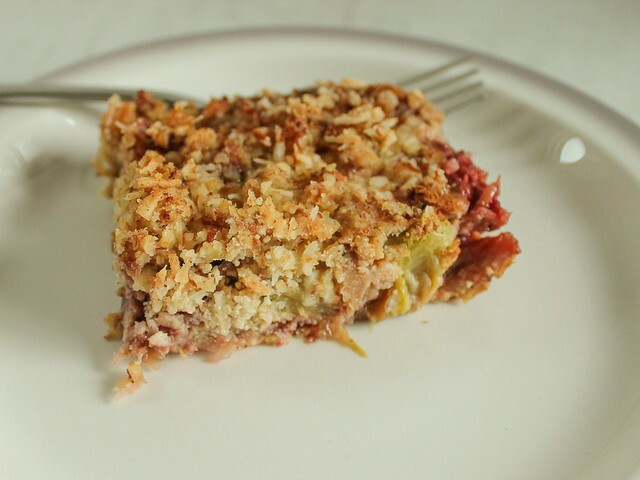 (Paleo and/or Gluten-Free) Strawberry-Rhubarb "Bars". It is no secret that I have a wicked sweet tooth. I have made great strides in consuming less sugar, specifically less desserts, but lately? Man. I am really craving the sweet stuff. I'll go ahead and blame the pregnancy hormones, which is fun and easy to do - but so far, I'm doing a pretty good job of not giving in to overly refined sweets. Part of the reason is that I'm finding naturally sweetened things to help me out. The post-suppertime call of dessert is after all a part of my genetic make up, and who am I to buck the mold and abstain? I suppose this dessert is mostly paleo friendly; it's definitely gluten-free and refined sugar free. It's also very much on the not-too-sweet side, leaving just enough room for a scoop of vanilla ice cream on the side, though I've been just as happy having a generous spoonful of full-fat plain Greek yogurt on top. To coerce my son into having some, I just added an extra drizzle of maple syrup over the top which made it plenty sweet enough to convince him that he might just like rhubarb after all. If you use frozen rhubarb and strawberries, there is no need to defrost them first. I think the flavor of the dessert is better the next day, after it has fully chilled and had a chance to "set up". These are the type of bars that require eating with a fork, unless you are very cautious and eat over the sink. Preheat oven to 350. Butter a 9x9 glass baking dish and set aside. 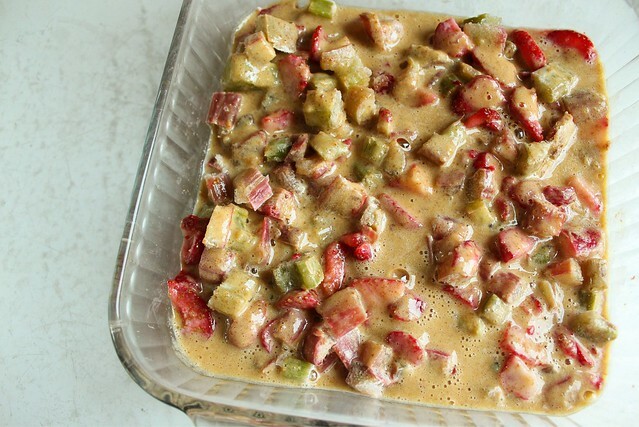 In a medium bowl, combine rhubarb, strawberries, 1 T. rapadura, 1 T. maple syrup, and cornstarch and stir well to combine. Pour into prepared baking dish. Using a blender, blend the eggs and dates until they are fully blended. Pour over the rhubarb and strawberry mixture. 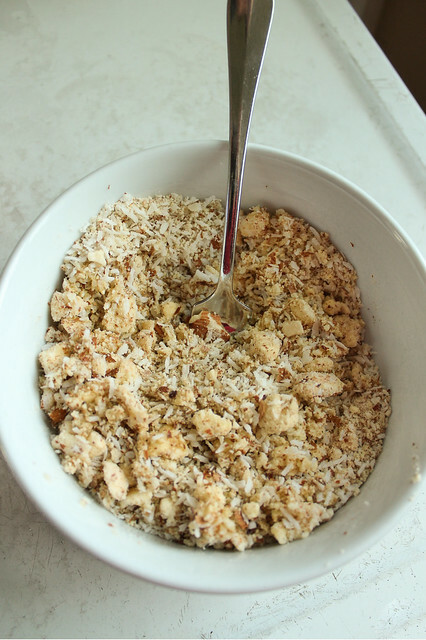 In a small bowl (or the same bowl you used to mix up the rhubarb and strawberries) combine the almond meal, coconut, salt, rapadura, oil, and butter and mix with your fingertips until you reach a good crumbly consistency. Spread evenly over the top of the dessert. Bake until puffed and lightly browned across the top, and a tester inserted in the center comes out clean - about 1 hour. Cool completely to room temperature, then store in the refrigerator. Serve with an extra splash of maple syrup, vanilla ice cream, and/or plain Greek yogurt. Spring in Wisconsin is off to a slow start - which is really excellent news for maple syruping, but not so good news for us sun-starved northerners. 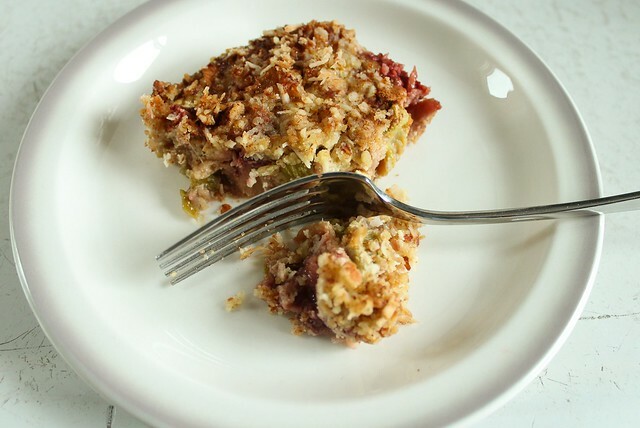 In many places around the country, the rhubarb is already up and ready to cut, but we're still waiting for a bit more warmth here to be so lucky. Then, I'll replenish my frozen stores and continue to repress my physical sensitivities to this most wonderful marker of spring. I'm sure I'll be figuring out a few more ways to enjoy rhubarb without so much sugar!